Q:What is the background to the creation of the home guard unit? A:The unit was created in 1985 to protect villages from LTTE attacks because at that time the army was unable to guard every village. The government gave weapons to selected youth in each village. Initially there was no payment involved neither did they have uniforms. Gradually the demand for their services grew and they were paid and were also given uniforms. Q: Can you comment on your appointment as the Director General of the Home Guard Force? A:After the ceasefire agreement when the situation was relatively peaceful, the importance of the home guard unit decreased and these people found other jobs. 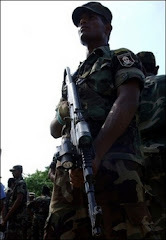 This year with the escalation in violence, villages are once again facing the threat of LTTE attacks. In the light of this the government wanted to re-organise the Home Guard Force. I was appointed in April by the President as DG in addition to my duties as the Deputy Chief of Staff of the Navy. Q: What have been your main tasks since taking up this appointment? A:During the first week, I did a study of more than 400 villages that are under threat, the exact number of home guards deployed in each village and also the minimum number required to protect each village in keeping with the recommendations of the army. I also recruited 5000 people from the affected areas. They underwent a two week training programme at Army and Special Task Force (STF) camps before being deployed. Q: On what basis were they deployed? A:They were deployed according to specifications of the Army and the STF .We have also begun issuing weapons to selected civilians on the recommendation of the police. This is meant as a deterrent against attacks on the homes of villagers. Q: What kind of training has been given to the home guards? A:They have been trained in the use of T- 56 automatic rifles, shot guns and repeater guns. They have also been given training in field craft and the general law. But the training doesn’t stop there. There are training teams that will visit each village regularly to continue training them as well as motivating them. Q: What are the most vulnerable areas? A:The Ampara district, parts of Moneragala, Trincomalee, Kantalai, Vavuniya and parts of Anuradhapura, Polonnaruwa and Puttlam. This is the threatened belt. Q: Since the Kebitigollewa tragedy, the villagers are refusing to return to their homes till the bunker line is put in place to secure their villages. Can you comment? A:These villagers need not be afraid to return to their homes once the Forward Defence Line (FDL) is established in the coming weeks. The work on the bunker line will also start very soon. Q: How bad is the threat to the areas excluding Kebitigollewa? A:I believe the situation is now under control. The required number of men will be trained and deployed in the villages and it will be their responsibility to protect the villagers. We have selected youth from their own villages because when they have to protect their own kith and kin they would do a better job than a person from outside. It is the responsibility of the army and the STF to supervise them. Responsible residents in the village including priests, retired teachers should also be vigilant of their activities and report to me if there are any lapses on the part of the home guards. Q: How important is the Home Guard Unit for the security of the country? A:I believe it is important as these threatened villages are a major component of the national security. If these villagers leave their homes and head south it could destabilise the whole country. So these villages have to be protected and the Home Guard Force is there to do just that. This is why the unit must be further strengthened. It is also the responsibility of every citizen in the country to ensure the security of these people by way of contributing in whatever way they can. Q: Any future plans for the Home Guard Unit? A: I think the government has plans to make it a permanent force. Now it is an auxiliary force .